This article is about the Lost World guardian from Donkey Kong Country 2. For the enemy species that's encountered in the Paper Mario series, see Clubba. 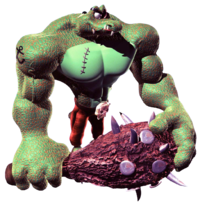 Klubba is a large, muscular Kremling who resides on Crocodile Isle. He appears in both Donkey Kong Country 2: Diddy's Kong Quest and Donkey Kong Land 2, in which he operates Klubba's Kiosk, a toll bridge to the Lost World. Klubba bears resemblance Kudgel, whose only aesthetic difference is his gray skin. It is unknown if they have any relation to each other. Klubba speaks in a stereotypical pirate accent, and uses typical pirate slang such as "matey". Klubba grants the Kongs access to the Lost World. In Donkey Kong Country 2, Kaptain K. Rool hired Klubba to prevent other characters from accessing the Lost World, specifically Diddy Kong and Dixie Kong. He runs a Klubba's Kiosk establishment in each world, starting with Crocodile Cauldron and ending with K. Rool's Keep. Klubba is unsatisfied with K. Rool's leadership, as evidenced from his dialogue: he believes that the Kremlings are "miserable" under K. Rool, that "Kaptain K. Rool treats us rotten! ", and hopes for the Kongs to "scupper his plans." Klubba provides three options to the Kongs, in order: "Pay 15 Kremkoins", "Fight Him", and "Run Away". 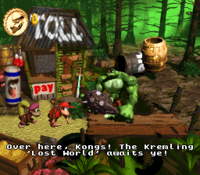 Given his greedy personality, Klubba allows the Kongs to access the Lost World for fifteen Kremkoins per level, with a single payment for each location. He even admits that his prices are high. His latter two options have an identical outcome, where Klubba uses his cudgel to whack Diddy and Dixie out of his tollbooth, and back into the world map. An optional mini-game was added as the fourth option in the Game Boy Advance remake, Bag a Bug. The mini-game involves Diddy or Dixie (depending on the lead Kong) attempting to collect fireflies while they avoid Klubba, who continually walks around the circular path, waiting to whack a Kong with his cudgel. Klubba typically displays rough and protective behavior, but after his payment, Klubba claims to offer assistance to the Kongs if they struggle with a level. However, he never provides any assistance of such. Klubba makes a final appearance in the "Cast of Characters" segment of the end credits, which even takes place outside his kiosk. Klubba appears in the Kremling Kuthroats class along with the other Kremlings. Klubba reappears in Donkey Kong Land 2. In it, he retains his role of guarding access to the Lost World. He only has one Klubba's Kiosk, which is located on the main Crocodile Isle map, left of Gloomy Gulch. He appears on the left side of the screen, as opposed to the right side from Donkey Kong Country 2. As a result, Klubba's sprite is also horizontally flipped. Unlike the previous game, the Kongs cannot individually pay for each level but rather make a one-time payment with all 47 Kremkoins to access the entire world. Krashes and Koshas from Donkey Kong 64 are similar to Klubba in that they wield a large club. Kosha and Klubba even share an identical Japanese name. During development of Donkey Kong Country 2, Klubba was planned as the boss of the Lost World, before being replaced with a rematch with K. Rool. Remnants of the fight were reincorporated into the fight with Kudgel. This page was last edited on March 16, 2019, at 21:55.